Latest poll released following merger of Yesh Atid, Israel Resilience shows Likud closing gap with left-wing joint list. Jewish Home at 6. The Likud has lost its place as the largest party in Israel, a new poll shows Thursday evening, but it would still have the easiest path to form a ruling coalition. 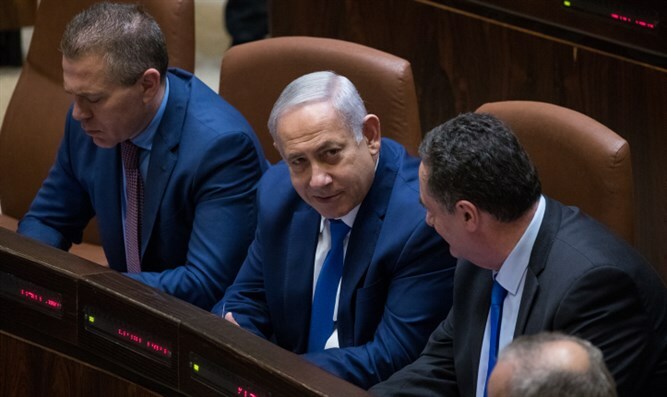 According to the poll, conducted by Direct Polls on behalf of Kan following the merger of Yesh Atid and Israel Resilience into the Blue and White party, the Likud would win 32 seats, a gain of two mandates, if elections were held today. The Blue and White party, however, would edge the Likud out by a margin of three seats, with 35 mandates. Labor, which won 24 seats on a joint ticket with Hatnuah in 2015, would fall to just eight mandates, while Naftali Bennett’s New Right would win seven seats. The joint list of the National Union, Jewish Home, and Otzma Yehudit would win six seats, as would Shas, and United Torah Judaism. The joint Arab ticket of Hadash and Ta’al would win 11 seats, while the Arab nationalist party Balad and the United Arab List would fail to cross the threshold. Yisrael Beytenu would win five seats, a decline of one mandate compared to its performance in 2015. Kulanu, Gesher, and Zehut all fail to cross the threshold. In total, the right-wing – religious bloc would retain a narrow majority of 62 seats, compared to 58 for the left-wing – Arab bloc. The right-wing – religious bloc won a majority of 67 seats in 2015, though that margin was cut by Orly Levy’s departure from Yistarel Beytenu in 2016.